The PBE has been updated! As we continue the 8.23 PBE cycle, today's patch includes tentative balance changes! 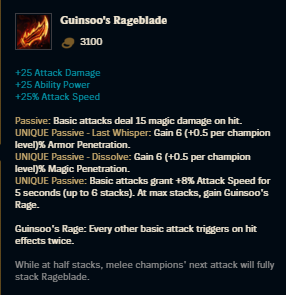 Unique Passive changed from "Regain an additional 20 health over 10 seconds after taking damage from an enemy champion." 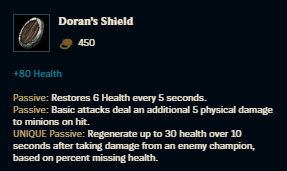 to "Regenerate up to 30 health over 10 seconds after taking damage from an enemy champion, based on percent missing health." UNIQUE Passive - Last Whisper: Gain 6 (+0.5 per champion level)% Armor Penetration. UNIQUE Passive - Dissolve: Gain 6 (+0.5 per champion level)% Magic Penetration. 11/6 PBE Update: Eclipse Leona, Coven Camille & Lissandra, Pajama Guardians, & More!